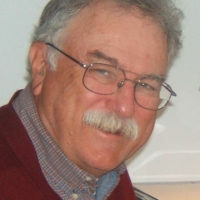 Gaboury died of cancer in Chicago Jan. 29. He was 78. Loyalty was his strong suit. He lived the PWW’s proud slogan, “We take sides … Yours!” He was a member of both the PWW Editorial Board and the National Committee of the Communist Party USA. Until the end he participated in PWW story meetings, venting his pithy and profane opinions about George W. Bush and urging wider coverage of the effort to oust him next November. He was honored as a hero of the labor movement at a PWW banquet in Chicago last fall. 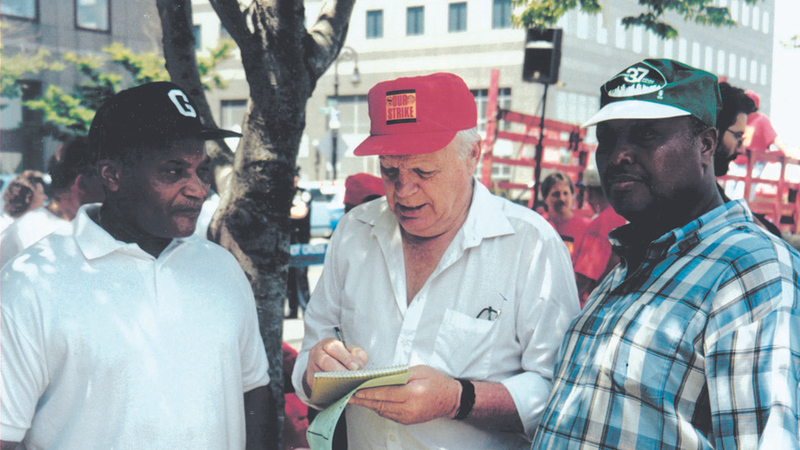 For more than a decade he was a regular at AFL-CIO Executive Council meetings. This reporter caught a glimpse last week of the affection for this gruff, larger-than-life, labor writer. I visited the offices of Donna DeWitt, president of the South Carolina AFL-CIO. She greeted me and then she asked, “How’s Fred?” Her face fell when I told her of Fred’s passing. “He always made us laugh every time we spoke with him,” DeWitt said. 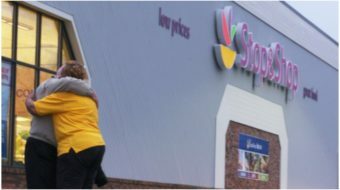 “We will miss him.” Her office assistant nodded in agreement. Gaboury worked with Rep. John Conyers (D-Mich.), a leader of the Congressional Black Caucus, helping to organize a grassroots movement in support of Conyers’ bill to create millions of jobs by shortening the workweek to 35 hours. 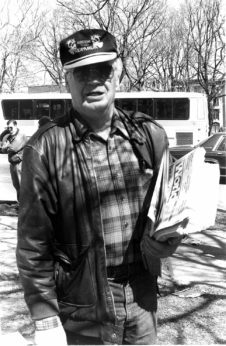 As field organizer of the Chicago-based Trade Unionists For Action and Democracy (TUAD) during the 1970s, Gaboury helped mobilize the rank and file movement seeking to break out of the “stand pat” trade unionism of AFL-CIO presidents George Meany and Lane Kirkland. He lived in Gary, Ind., with his wife, Jean Thurmond, during those tumultuous years. That movement reached a high point in the spring of 1981 when union activists met in Buffalo, N.Y., to plan a huge march on Washington. Kirkland opposed the march but support mushroomed so quickly that he reversed course. On “Solidarity Day,” Sept. 19, 1981, hundreds of thousands of trade unionists marched in the streets of Washington protesting Reagan’s smashing of the air traffic controllers union. Gaboury organized the distribution of nearly 100,000 copies of Labor Today at that march. In 1984, TUAD produced a button with a prune-faced Reagan caricature and the slogan, “Out the door in 84.” More than 80,000 buttons were sold. All these efforts bore fruit in October of 1995 with the election of John Sweeney, Linda Chavez-Thompson and Rich Trumka to lead the AFL-CIO. In the late 1980s, Gaboury replaced Ernest DeMaio, a founder of the United Electrical Workers, as UN representative of the Prague-based World Federation of Trade Unions (WFTU). He became a familiar figure in the corridors of the United Nations and also wrote extensively on UN affairs. Fred Gaboury was born in Longview, Wash., on Dec. 29, 1925. A year or so later, his mother, Vivian, moved with her growing family to Port Angeles where her parents lived. She met and married Harvey Gaboury, a construction worker. They moved to a stump farm in the foothills where Fred attended Mount Pleasant Elementary School. He graduated with straight A’s from Port Angeles High School. He was drafted into the Air Force during World War II and briefly attended West Point after the war. He returned to Port Angeles in 1946 and married Betty Johnson, a high school classmate. They later divorced. Gaboury went to work as a logger. Under the tutelage of Communist loggers Don Hamerquist and Russ Farrell, Gaboury became a militant rank-and-filer in the International Woodworkers of America (IWA). Hamerquist trained Gaboury as a topper and rigger, the most dangerous (and prestigious) job in the nation’s second-most-dangerous industry. As a 13-year-old, this writer rode the Weyerhaeuser Timber Co. crew bus with Gaboury high up into the Olympic foothills one cold, rainy dawn and watched him rig a 120-foot Douglas fir as a spar tree. Later, he won first prize at a logging show during the Irrigation Festival in Sequim, Wash., for his climbing skills. His sister, Lillian, remembers that after World War II, there was a strike in the woods every year or so and loggers were the highest paid industrial workers in the region. “Fred was always a picket captain,” she said. “The timber companies hated him so much they put out a contract on him, ‘a thousand dollars dead or alive.’” They obviously didn’t succeed. But the timber barons found a more effective way to smash the union. The leader of the IWA in northwestern Washington was Karly Larsen, a Communist Party member. He was forced to resign under the Taft Hartley Act and was indicted under the Smith Act in 1952. The Communist Party of Washington State waged a heroic battle to “defend Karly Larsen.” Fred Gaboury and his mother led that battle in Clallam County. He lived to see the anti-communist clause removed from the AFL-CIO constitution. Fred Gaboury is survived by his companion, Marianne Ogren, son, Rob, daughter, Cindy, brother, David, and sisters Lillian and Adele. His wife Jean Thurmond preceded him in death in 1990. Memorials are being planned for Fred Gaboury in both Chicago and Washington State.